The new Samsung Galaxy J2 Core rolls out in India and Malaysia today, but other markets should follow in the near future as well. This handset's list of specs includes a low-resolution 5-inch display, 1 GB of memory and 8 GB internal storage space, 5 MP and 8 MP cameras, and the Exynos 7570 processor. Described as "an introductory smartphone packed with performance," the Samsung Galaxy J2 Core is just another Android Go that comes without anything surprising under the hood — except the processor. While most other Android Go handsets we bumped into so far used low-end Qualcomm and MediaTek processors, Samsung's first such effort is powered by the quad-core Exynos 7570 SoC. 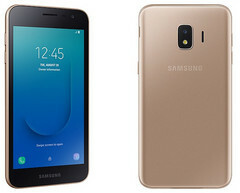 In addition to the processor mentioned above, the Samsung Galaxy J2 Core sports the following: a 5-inch TFT display with only 540 x 960 pixels, 5 MP and 8 MP cameras with f/2.2 (front and back), 1 GB of memory, 8 GB internal storage, microSD support, a 2,600 mAh battery, Android Oreo Go edition. The list of connectivity options only contains the bare necessities as well: USB 2.0, Bluetooth 4.2, WiFi 802.11 b/g/n, GPS with GLONASS and BeiDou support. Since the regular Samsung Galaxy J2 has a price tag a bit over US$100 — and slightly better specs than the Galaxy J2 Core — the new Android Go handset should sell for under US$100, no matter the market. Given the poor software support provided to the mid-range and low-end handsets by this brand, why would you bother buying an Android Go smartphone by Samsung? Let us know in the comments.